One of my favourite things right now is my Kindle! I love it and take it with me everywhere. I have the Kindle Keyboard 3G. I went with this version specifically for the 3G, but it also has wi-fi. Both of them are free (no additional charges). I love the fact that this device fits in my purse and can come with me everywhere. I love that I can be reading multiple books at once, have them all with me but not have to carry numerous books with me. I can't even tell you how many times I've heard about a book and wanted to check it out, but would forget about it. 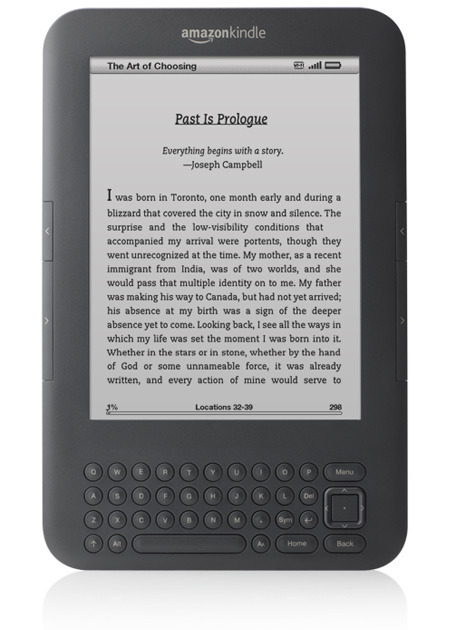 With Kindle, I can look up the books right away and buy it, if I want it, in a matter of seconds. Or, I can add the book to my wishlist so I can look at it later- which is what I usually do. Prices are pretty reasonable ($4.99 and $9.99 are popular prices but tons of books for free!) and it's environmentally friendly- saving all those trees. What else do I like? It reads to you! Sure, the voice are options aren't amazing, but better then nothing. Plus, you can access the internet from it and load mp3s. Yes, I love my Kindle and I can't imagine going back to life without one.